Edited to Add: With the ongoing issues related to the Mentality Polish Neons I'm adding this information to ensure all of you that attempt to make your own polishes, especially with neon pigments are as informed as possible. The most comprehensive coverage summary of the Mentality Polish issue I've read is here on the Mercurial Magpie blog. Please ensure you read this facebook post by Franken Nail Polish (which is the same people who run NailSuperstore.com.au and supply all artisan Australian indie brands). The article is about how some neon pigments have a resin coating than can break down in lacquer base over time and release formaldehyde as it dissolves. For this reason, the Australian supplier is discontinuing their line of neon tinters. Also read this post from Lad Muffin about possible reasons for the Mentality polish issues. Just remember, nail polish is made up of a whole bunch of chemicals, and adding mixing various components can have many unknown consequences. Not all neon pigments are created equal when it comes to putting them in lacquer, in pretty much the same way that not all glitters will handle being in lacquer. Not much of a problem if you are making polishes for yourself as you assume all the risk, but it could be a big problem if you are reselling your creations. And if you are selling your creations, for Gods sake make sure you have product liability insurance. If you can't afford it, then you shouldn't be in business selling your products! Over the last month or so I have really been putting the Pipedream ANIVC polishes through their paces as a collection of neon polishes. But we all know how damn impossible it is to buy the Pipedream neons. The restocks are not even announced anymore, so the chances of getting them are Buckley's (for my non Australian readers, find out what Buckley's chance is). Indigo Bananas, Neon the 10th Element Collection. If you check out all these collections you will see they are all generally the same colours. That's because they are generally made using the same or similar coloured neon pigments. 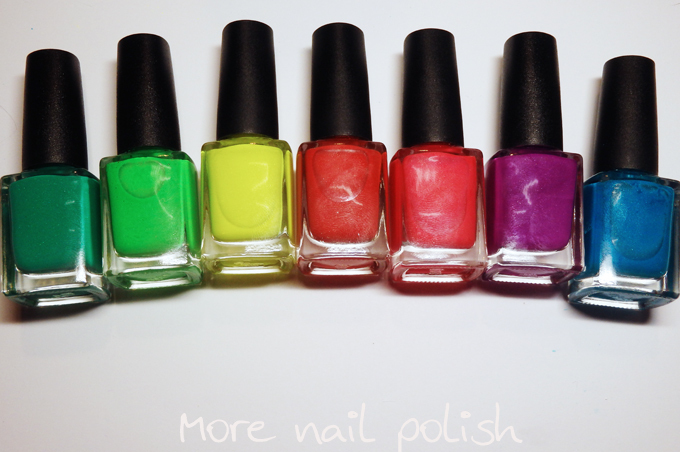 Because of this, it is easy to make your own collection of neon polishes. 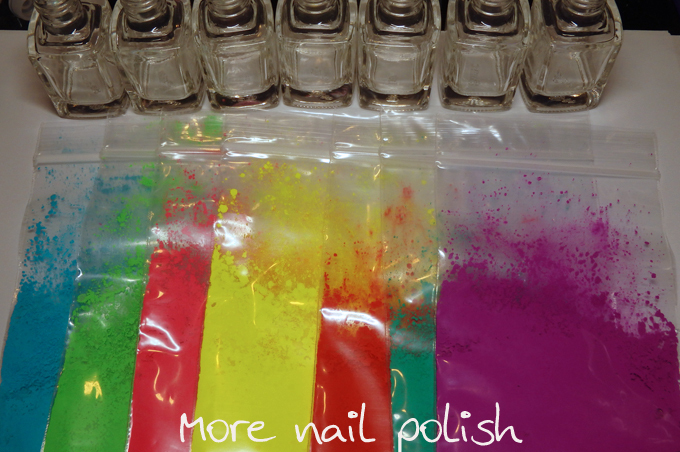 Plus today I'm going to share my secret for making them work well for watermarbling. You are going to need empty bottles (obviously) and you will need nail polish suspension base (obviously). There are a few places you can get these. In Australia from the Nail Super Store and in the USA from places like Wonder Beauty Products, TKB trading and Llarowe - I'm sure there are others, but given I'm in Australia and get mine from the Nail Super Store, I've never bothered researching where else. These are the bottles I use from the Nail Super Store. I use JOSS untinted lacquer base +silicia. 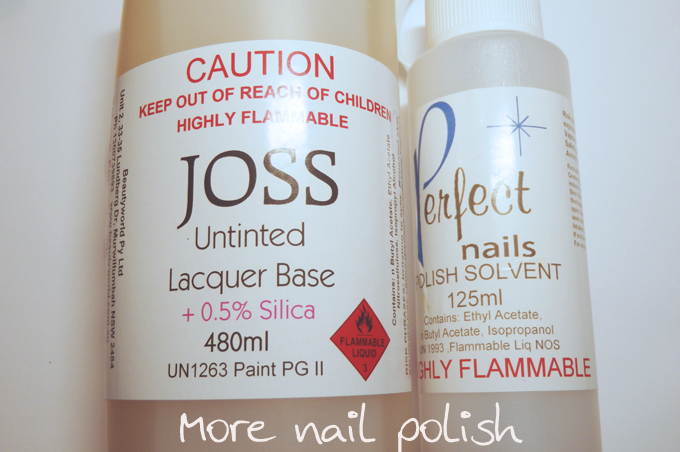 You don't need to the +silica one for these polishes, but I tend to buy that one as it suits my hobby polish making requirements best. 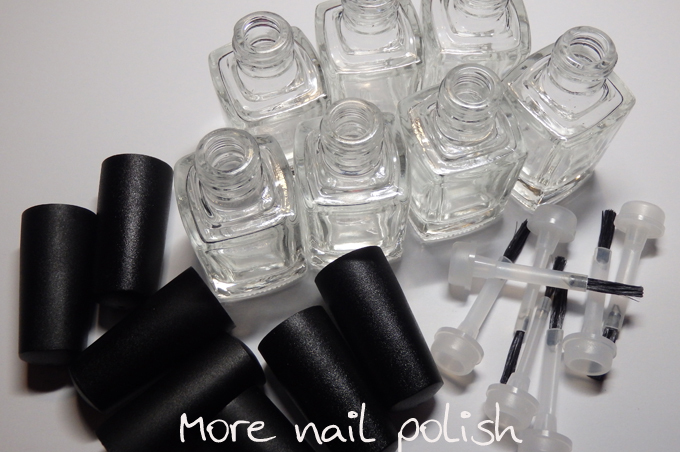 You will also need to nail polish thinner. 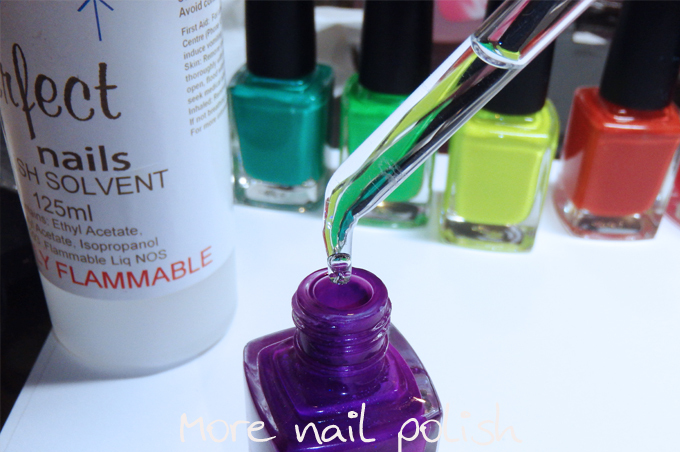 I use Perfect nail polish solvet also from the Nail Super Store, you could also use Seche Restore. Next you will need some fluro or neon pigments. Again, there are a number of places that you can buy these from. I was gifted the below sample bags to play with from polish making extraordinaire Hayley of Emily de Molly and I don't know where she got them from. But some places to get them are Glitter Unique, TKB Trading and Solor Color Dust. The nail super store and Wonder Beauty also have liquid neon tinters. You are also going to need some white pigment. You can do this is powder form, but I use the JOSS Titanium Dioxide tinter. It's pretty easy to mix up a bottle of polish. 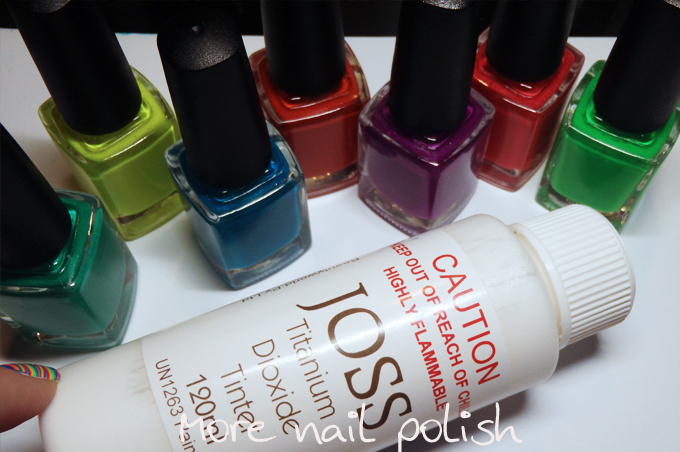 I'm a hobby maker so I just mix my polishes in single bottles, not in large quantities like indie makers. My process is to fill the bottle about half full with untinted nail polish base, then I use a cut up straw to spoon in the pigment. 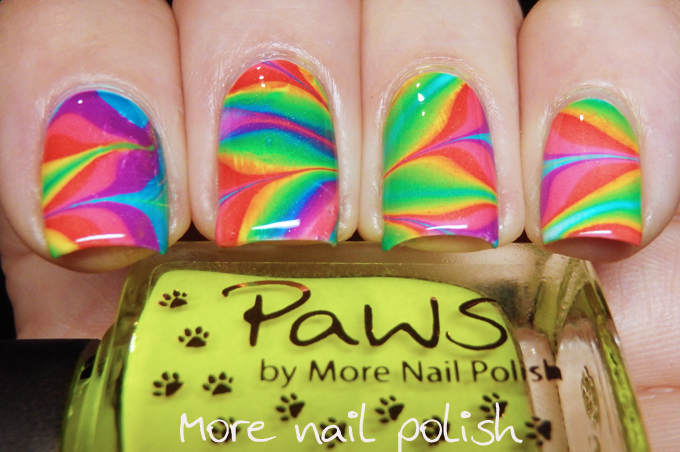 I like to add heaps and heaps of pigment to get the polish highly saturated and opaque. For me, this is what works best with water marbling. I think I used about 20 straw spoonfuls of each pigment into the bottle. I also add a few drops of white pigment just to make the finish more opaque, but not too much that the make the polish pastel. Then again, if you want to make pastel neon polishes, just add more white! I then shake that up and test the colour. I add more pigment if required and also top up the polish until it's nearly full. Next - and here is my trick. I add a lot of thinner. I usually add a full dropper full into the polish. Sometimes I will add two droppers full, sometimes more depending on the amount of pigment I added. The end result that you want is a thin but highly pigmented polish. You want it to be able to drip off the end of a brush easily and for it to have enough colour to easily show up when it's only one thin layer on the water. Now I give it a good shake, a really good shake. I also use my tattoo ink mixer to mixed them even more. Then I add my custom little labels, which of course are completely unnecessary when you are making them for yourself, but I still love my polishes to all match. 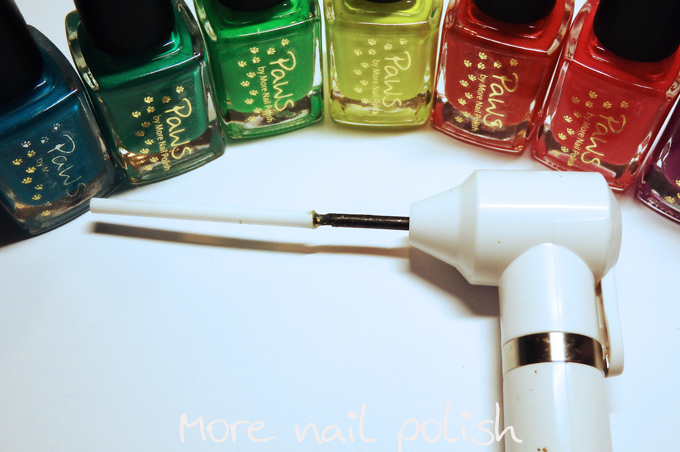 I also test out the polishes on water as I go, to make sure they are thin enough and pigmented enough. 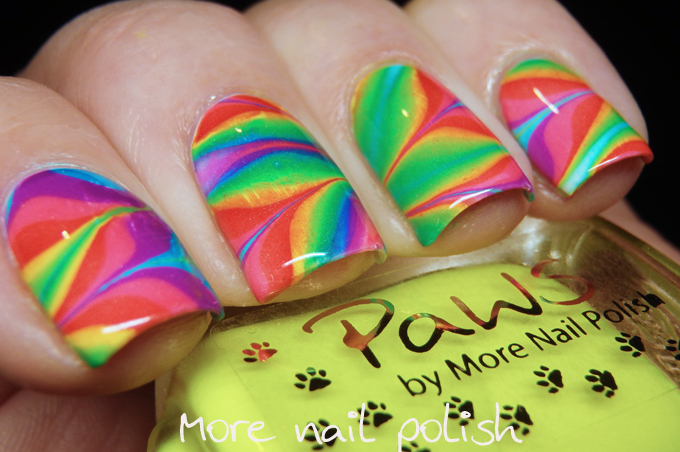 Just to prove they work nicely for a water marble, here they are in action. 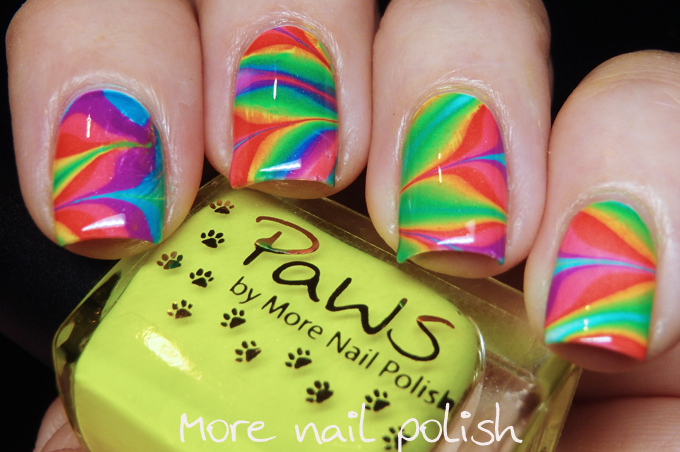 And my first mani with these... Now I just need to get a few more pigment colours to complete my rainbow collection. Thank you so much for this informative post! 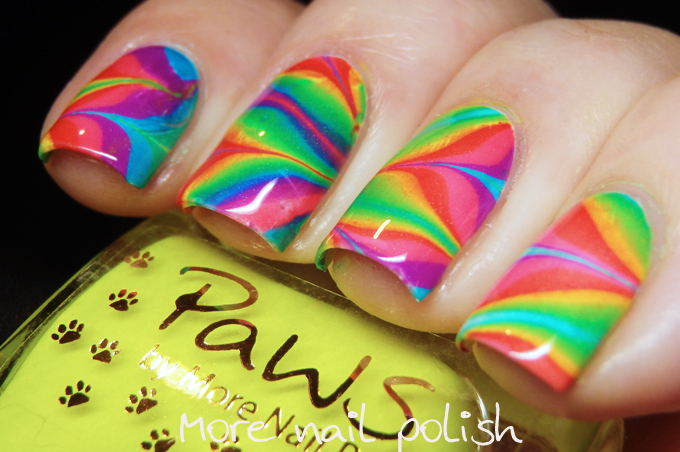 I've been looking for a good neon that works for water marbling. I know the Pipe Dream neons are good, but they are so hard to get and not cheap. I am in Germany and so far have not found nail suspension base. Is it possible to simply use clear nail polish instead, or is it severly different from suspension base? The pigment will likely sink without suspension base. You'd have to shake the polish up everytime you use it. Awesome post! As a collector of neons the pipe dream polishes were at the top of my list until I realized how hard it was to get them. I never really thought seriously about making my own polishes until this post! Thank you! This was awesome, must save this for later. I'm so into this. :D Thanks for an awesome post! Thank you so much for such an informative post, Cathy! I'm so going to try this! What a fantastic post tfs! Wow really nice!!! I absolutely have to try! Thank you for the tips ! I couldn't stop staring at your nails!! So pretty!! Thank You, You are an absolute treasure, I too, saw the Pipe Dreams and longed for them. I love your Franken Posts and I wondered if you still made your own polish or are too busy now. I have these pigments I bought a few months ago and forgot about them. I can't believe my luck that these are THEM. I've been wanting to ask you this question for so long, where can I get stickers for my bottles? Yours are adorable. Also, the thinner in the marble polish trick, than you so much, I have been failing miserably at water marble. This is so amazing! I'm seriously thinking about doing this, but I think in the end it wil get more expensive than buying from indie sellers - mostly because of shipping and because I'm bound to screw something up! :p haha.. Thank you so much for sharing this information. Now I know how to do this I'm definitely going to give it a try. I live in Tasmania, and lack of nail art supplies/polish is a big problem. I have to buy nearly everything from the mainland or overseas. Love your blog. I got my labels through http://www.4cp.com.au/. They are a nice quality with foil printing and clear backgrounds. I recommend them. I just checked that site and couldn't find a clear background option in the labels list. Did you have to put in a special order for them, Kitties26? I just email them and told them what I wanted and what it was for. I just did the order though email as they were recommended to me by another Australian indie brand. Thanks a lot. I'll see how I go. I really appreciate your help. Just curious, I'm in Australia also and would like to just get some powderd pigment like you have in your pics as the other otpion is HUGE bottles of Joss fluro base and I just don't need that much... where did you get your small bags of tint from? I actually got my pigments from the maker of Emily de Molly, who also lives here in Canberra. Your best options for small bags of pigments are the places I listed above, Glitter Unique, TKB Trading and Solor Color Dust.